I have always been a MEGA fan of dark green leafy vegetables. In previous posts, I’ve talked about my passion for spinach, but I don’t think I’ve ever really mentioned my love for kale. It’s one of those vegetables that’s so incredibly versatile. 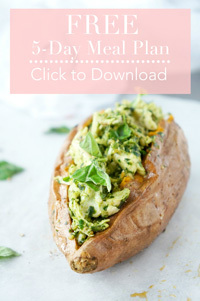 You can incorporate it into pretty much any meal ranging from smoothies, to kale chips to kale salad. Because I was always such a spinach girl growing up, I never felt all that inspired to put kale in my salad. For one thing, it was super tough and bitter and just didn’t seem all that appealing at the time. Until I learned *the secret* to making kale taste A-M-A-Z-I-N-G in salad. Curious what that secret is? Well, there are a few different steps required to make the PERFECT kale salad. First of all, you have to make sure that you massage the kale leaves for a few minutes (I like to do that with some olive oil) to reduce the bitterness and toughness. This step alone softens the leaves and makes such a difference in the overall taste and texture. Next, it’s important to combine the kale with the right ingredients. I’ve learned through trial and error, that kale tastes incredible with roasted vegetables. 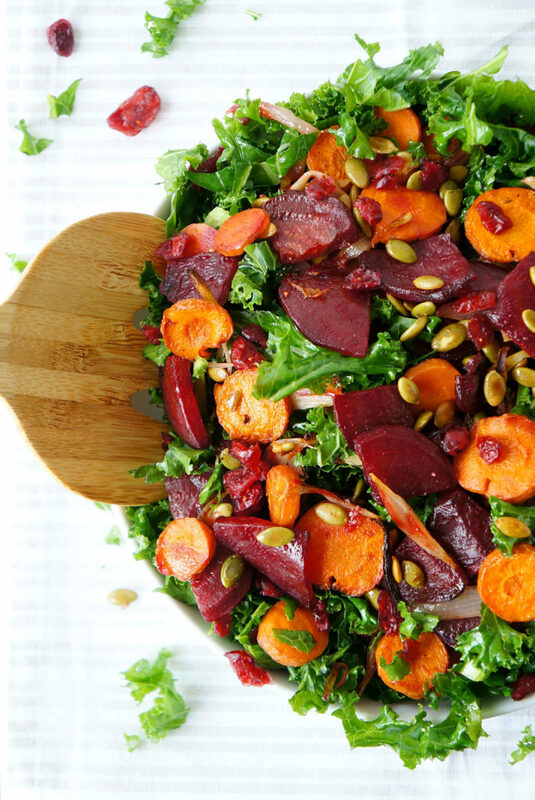 Throw some dried cranberries and pumpkin seeds in the mix and you have the perfect combination for a beautiful and tasty kale salad. Finally, it’s ALL ABOUT THE DRESSING. You can’t have a mouthwatering kale salad without a delicious dressing. Especially if you allow the kale and roasted vegetables to just sit in the dressing for a few hours absorbing all of those wonderful flavours. It seems that the longer it sits, the better it tastes. THAT, my friends, is the secret to a delicious kale salad. And the perfect example of a gorgeous and mouthwatering salad that incorporates all of these tips is this Roasted Beet & Carrot Kale Salad. 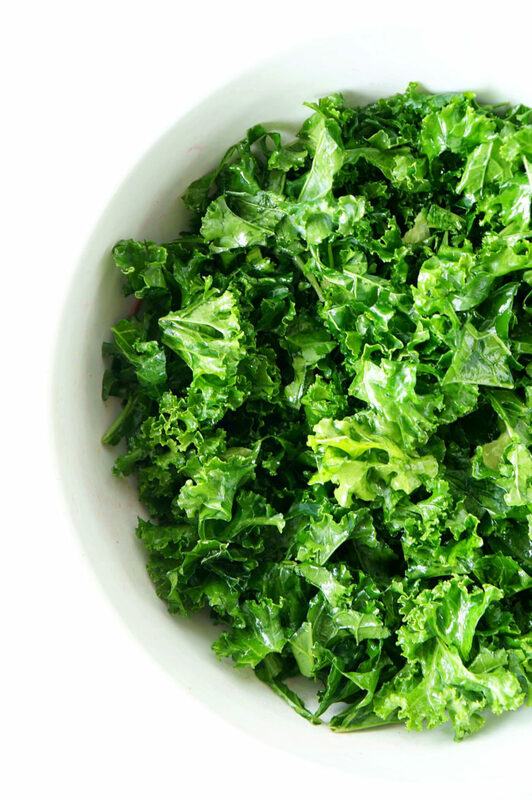 Kale – This green, leafy vegetable is all the rage these days and reasonably so. It’s high in vitamins A, C, and K, and is also a good source of fiber and potassium. Beets – This vegetable is seriously underestimated, but can be a tasty and nutritious addition to any meal, AND they’re especially great in salads. 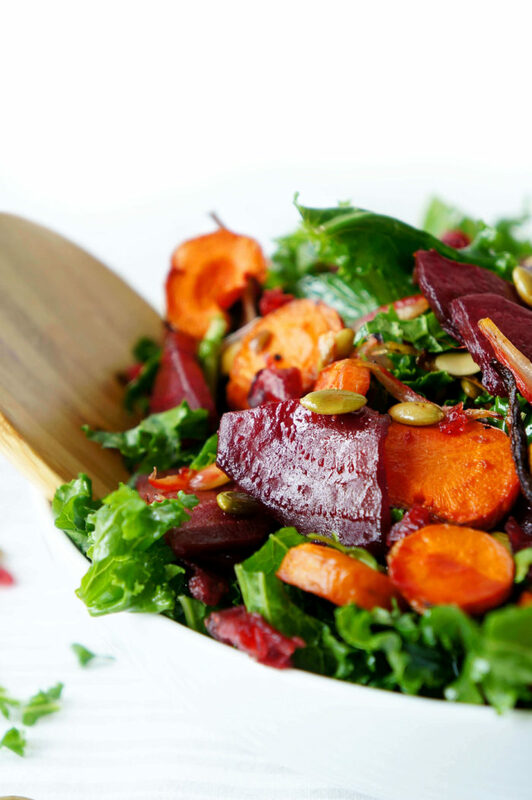 Half a cup of cooked beets contain only 40 calories and are a good source of fibre. They’re also rich in folate, which is necessary for healthy red blood cells and for synthesizing and repairing DNA. Additionally, it can help decrease the risk of some cancers. Furthermore, they’re a source of potassium, which is good for overall heart health and may help reduce blood pressure. Their pretty jewel-coloured red pigment, known as betalains have antioxidant and anti-inflammatory properties. See, who ever said beets were boring?! Carrots – When we think of carrots, the first thing that generally comes to mind is their bright orange colour, which is derived from their beta carotene content. When we consume beta carotene, some of it gets converted into retinol which is the active form of vitamin A. Vitamin A has numerous benefits including strengthening the immune system, preventing dry eyes, night blindness and impaired bone growth. So there’s a little nutrition lesson 101. 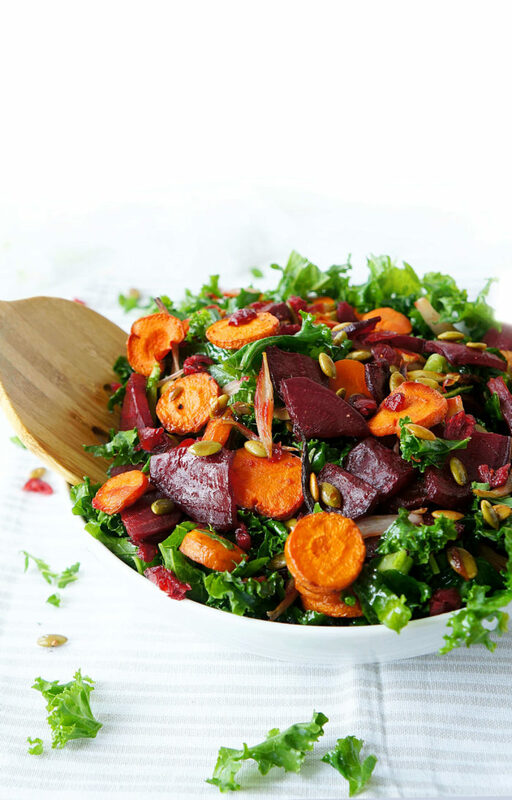 AND the best part is, you can find all of these benefits packed into this salad recipe. 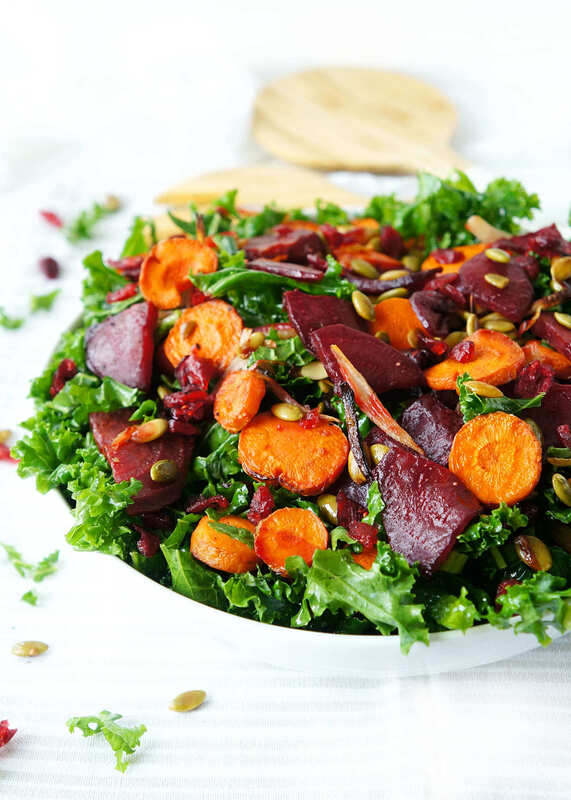 Now, we’ve had this Roasted Beet & Carrot Kale Salad a number of times over the past few weeks and it just seems to taste better and better each time we have it. One night for dinner, we served it along with this Curried Pumpkin Chicken Soup. That is a TRUE Fall meal. Another night, we had it with these Almond and Coconut Crusted Fish Sticks and Cinnamon Paprika Sweet Potato Fries. If you want to make the salad more of a complete meal, feel free to throw some chicken and goat cheese in there, or if you’re vegan, some roasted chickpeas would be awesome. So many options for this gorgeous salad! 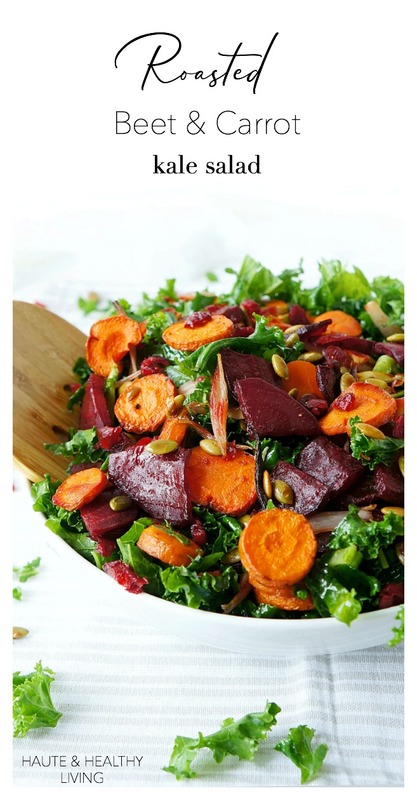 Preheat the oven to 425 degrees F. In a large bowl, combine beets, carrots, 2 tbsp. of the olive oil and salt and pepper. 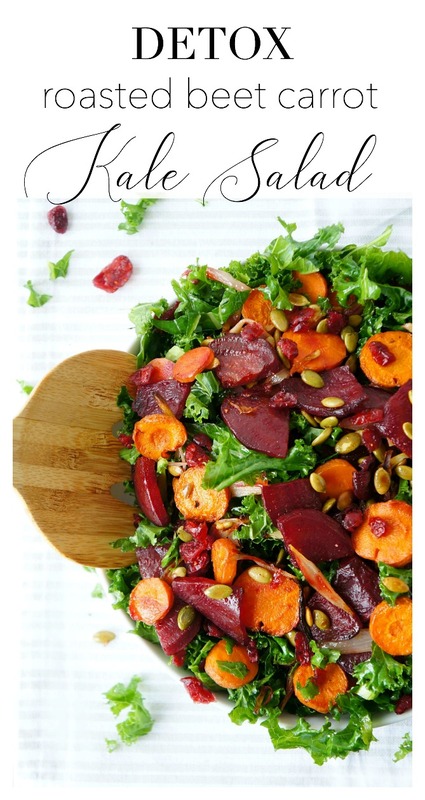 Add carrots and beets to a baking sheet and roast in oven for 10 minutes. 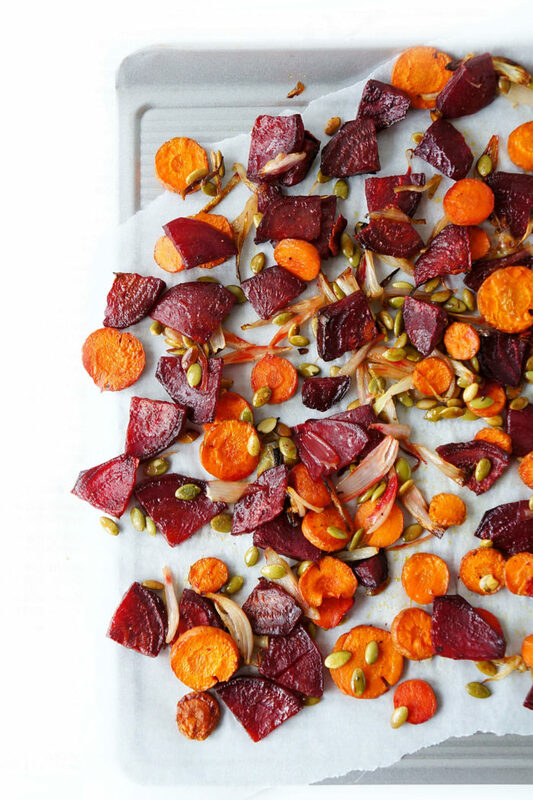 Remove from oven and toss the shallots and pumpkin seeds with the beets and carrots on the baking sheet. Roast for an additional 20-25 minutes or until the vegetables are just tender. Meanwhile, place the chopped kale in the same bowl where the beets and carrots were. Add remaining tablespoon of olive oil and massage into kale leaves with your hands until the leaves are bright green and tender, about 2-5 minutes. In a small bowl, combine the ingredients for the dressing. Remove vegetables from the oven and allow them to cool for 5 minutes. Add vegetable mixture to the bowl with the kale and toss with the dressing until well combined. Add the dried cranberries. Allow salad to sit for at least 30 minutes to allow the flavours to combine. Serve cold or at room temperature. Hi Elysia! Can this salad be made the day before and refrigerated overnight? Hi Shannon! Definitely! I ate the leftovers the next day after it had been sitting in the fridge overnight and it was still delicious. I always find that the longer kale sits in the dressing the better it tastes. Root vegetables would be similar. Alternatively, if you didn’t want to add the dressing to the salad the night before, you could simply assemble the salad ingredients to leave in the fridge and add the dressing a few hours before serving. Hope you enjoy! Elysia, this salad looks amazing! I can’t wait to make it! Thanks Olga! It’s one of our favourite salads! Hope you enjoy it if you try it out! Elysia, this is absolutely delicious and so easy to make. Fantastic salad! This is going to be a repeat dish in my home! Thanks so much for the feedback Polly! So glad you enjoyed it! It’s so tasty! Just made this salad! I Had to make a last minute dish for a party… this was so tasty! So glad you enjoyed it Nataly — thanks for stopping by to comment! It’s definitely one of our favourite salad recipes! Elysia, it’s very delicious! This salad has EVERYTHING I love. Elysia, this is such a delicious meal! I love making it for the family ! So glad you’re loving this recipe Mariya! It’s one of our favourites for sure!